PCOS affects at least 7% of adult women. Research suggests that 5% to 10% of females 18 to 44 years of age are affected by PCOS, making it the most common endocrine abnormality among women of reproductive age. 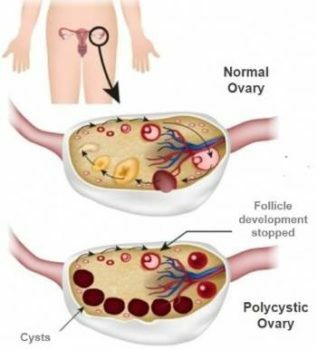 The exact cause of the polycystic ovarian syndrome is not known. However, several factors including genetics have been implicated to play a role in the development of PCOS. Women with a prior family history of polycystic ovarian syndrome are at a higher risk of developing this condition. Researchers have also found an association between excessive insulin production and the development of PCOS. The insulin hormone regulates the blood sugar levels and any disorder affecting the insulin mechanism may result in excessive insulin secretion, which triggers androgen secretion from the ovaries. Low grade inflammation, in response to ingestion of certain foods, may lead to the release of substances that may cause insulin resistance and cholesterol accumulation in the blood vessels or atherosclerosis. Clinical studies have demonstrated the presence of low grade inflammation in women with PCOS. Excessive exposure to the male hormone in foetal period may disrupt the function of normal gene and increase the risk of insulin resistance and low grade inflammation. Infertility: PCOS is one of the most common causes of female infertility. Menstrual disorders: can include absent or irregular menstrual cycle. periods that occur infrequently or too frequently, heavy periods, or unpredictable periods. Obesity or accumulation of fat, usually around the waist. Up to 80% of women with PCOS are obese. Abnormal facial and body hair: Excess hair growth on the face, abdomen, chest, or upper thighs, This condition is called hirsutism and affects more than 70% of women with PCOS. Adult acne usually occurs after adolescence and does not respond to usual treatments. Male pattern of baldness or hair thinning may also develop due to excessive androgen secretion. Patches of thickened skin: In some patients black or dark brown patches darkened skin called “acanthosis nigricans” are seen around the skin of the neck, arm, breasts or thighs. Patient may often experience anxiety or depression and breathlessness during sleep. There is no definitive test for PCOS. The diagnosis is primarily based on the medical history along with physical and pelvic examination. Medical history along with the physical and pelvic examination evaluates the condition of the patient and helps identify the underlying cause. Blood tests are conducted to determine the level of various hormones. Addition tests such as glucose tolerance test and evaluation of blood cholesterol may also be conducted in these patients. Pelvic ultrasound is performed to evaluate the appearance of the ovaries and the uterine lining. Treatment for PCOS is mainly directed at the symptoms and individual concerns such as infertility, irregular menstrual cycle, acne or obesity. Both medications and surgical treatment can be used for the management of PCOS. Treatment goals include correcting anovulation, inhibiting the action of androgens on target tissues, and reducing insulin resistance. Weight reduction for obese patients with PCOS is beneficial in many ways. Weight loss helps to decrease androgen, luteinizing hormone (LH), and insulin levels. It also helps to regulate ovulation, thereby improving the potential for pregnancy. Infertility may be treated by fertility therapy with ovulation-inducing drugs. Clomiphene citrate, an oral anti-oestrogen, may be prescribed to the patients. In some patients, the doctor may add metformin to Clomiphene help induce ovulation. In patients not responding to Clomiphene and Metformin, gonadotropins, namely, follicle-stimulating hormone (FSH) and luteinizing hormone (LH) can be administered by injection. Oral contraceptives may be prescribed for the management of irregular menstrual cycles. Oral contraceptives effectively reduce the level of male hormone and are also effective in reducing the excessive body hair growth and also minimize the risks of uterine cancer. Patients with PCOS may frequently develop other serious medical conditions such as diabetes mellitus, cardiovascular diseases, pregnancy induced high blood pressure, miscarriage or premature delivery. Women with PCOS also tend to have “endometrial hyperplasia”, in which the lining of the uterus becomes too thick. This condition increases the risk of endometrial cancer. These patients are also at risk of sleep apnea, anxiety or depression. Yes. Having PCOS does not mean you can’t get pregnant. PCOS is one of the most common, but treatable, causes of infertility in women. In women with PCOS, the hormonal imbalance interferes with the growth and release of eggs from the ovaries (ovulation). If you don’t ovulate, you can’t get pregnant. Your gynecologist can talk with you about ways to help you ovulate and to raise your chance of getting pregnant.